I caught this stylish trio of friends walking down Michigan Avenue. My street-style eye instantly honed in on them out front of Crate & Barrel, where they were practically drowning in a sea of tourists. Each one of these girls had that little dash of personality that makes a typical outfit extraordinary. Melissa’s multi-colored puff of hair reminded me of Chicago streetstyle legend Rhea. Kamilah’s hair was inspired by the singer Rihanna, and I loved her multi-colored toenails. Kendra is rocking the super popular trend of sleeveless denim vests embellished with pins, a trend that was also spotted on Rachel and Ralphy’L. What I found interesting is that all three are wearing light colored denim tops. 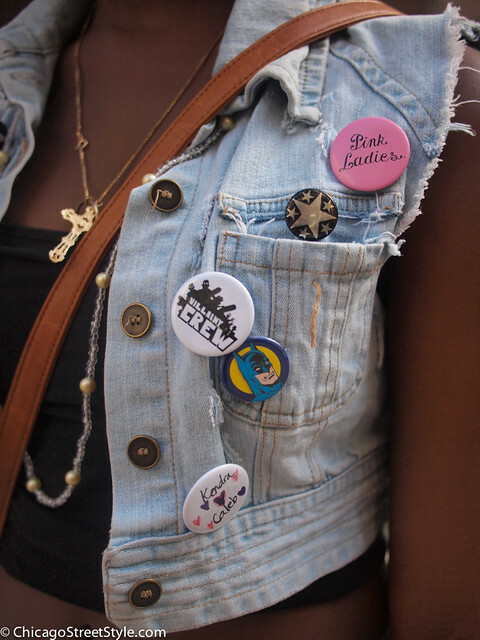 Sleeveless denim vests in particular are gaining popularity fast, especially when adorned with buttons and patches. 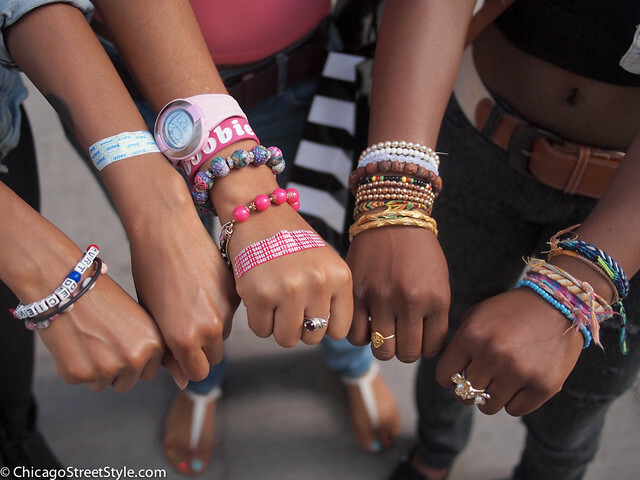 They’re all also wearing band-aids as accessories, which is something I haven’t seen in years. What goes around comes around, right? The multi-layered stacking of bracelets is another super popular trend this summer, and one that was the subject of it’s own entire post, TRENDS: Piles of Bracelets. Side note: I am in a very fortunate position to have the freedom to photograph both high fashion and popular fashion. I love the authenticity of these three Chicago teenagers who truly put care and thought into making themselves look different from the masses. After all, isn’t that what personal fashion is all about? my kind of crowd. fashion-forward.